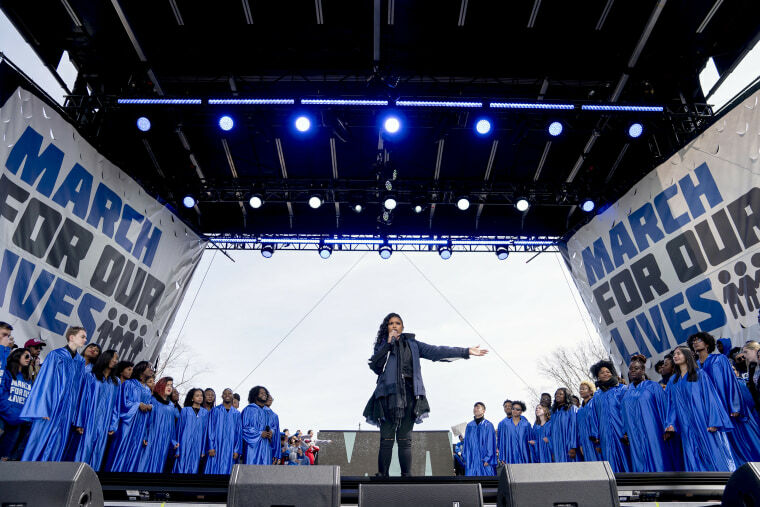 Whether standing in the crowd or performing on stage, a number of celebrities showed their support for student activists rallying against gun violence. Yesterday, in more than 800 cities around the world, protesters flooded the streets as part of the student-led March for Our Lives rallies demanding increased gun control and against gun violence. Dispersed among the thousands of protesters calling for action in the wake of Feb. 14’s shooting at Marjory Stoneman Douglas High School were several celebrities. "Tonight Show" host Jimmy Fallon marched with his wife, Nancy Juvonen, and two daughters, Winnie and Frances. Fallon also showed his support for the efforts by sponsoring a bus to send young people to the march. “Today is @AMarch4OurLives. I’m partnering with @MTV and @NAACP to sponsor a bus full of smart young people traveling from NYC to #MarchForOurLives Washington, D.C. today. Thank you for standing up and saying you’ve had #ENOUGH. See you there," he shared on Twitter. Fallon and fam were joined in D.C. by other celebs, including George and Amal Clooney, who donated $500,000 to the march. The "Dreamgirls" singer sang Bob Dylan’s “The Times They Are a-Changin" with a full choir behind her. At the end of her performance student organizers joined her on stage. Musician Paul McCartney of The Beatles was a notable sight alongside those marching in New York. In New York, McCartney was joined by newly-announced gubernatorial candidate Cynthia Nixon, and television host Padma Lakshmi, among others. On the west coast, Reese Witherspoon marched with "Big Little Lies" co-star Laura Dern in Los Angeles. Singer Demi Lovato performed her emotional song "Skyscraper" at the Washington D.C. rally. On Instagram, the star wrote "Today is the day, let your voices be heard," and added a heart emoji. Miley Cyrus also performed at the D.C. rally, singing "The Climb" while holding a sign that read "Never Again." Ariana Grande performed "Be Alright" from her album "Dangerous Woman." "This is for those brilliant students here today that are leading this march and for everybody participating today," she said after her performance. "Thank you so much for fighting for change and for love and safety and for our future," the singer added. Lin-Manuel Miranda of the hit Broadway musical "Hamilton" and fellow theater star Ben Platt of "Dear Evan Hanson," performed "Found Tonight," at March For Our Lives. The single, released for the protests, is a mash-up of Hamilton's "The Story of Tonight" and Dear Evan Hansen's "You Will Be Found." After performing, Miranda said "We love you, don't give up." The march at the nation's capital featured moving speeches from survivors, including a gut-wrenching deliverance from shooting survivor and march co-organizer, Emma Gonzalez. After speaking, the 18-year-old paused and the crowd observed approximately six minutes and about 17 seconds of silence, the amount of time it took the Parkland shooter to kill 17 students and faculty members. In total, more two dozen marches took place in large cities, including Miami, Houston, Atlanta, and more, but the rally also had attendees in Israel, India, France, and even Antarctica.